As an commercial electrician we are often called to look at changes that have to be made to electrical systems in shops and offices. We see more and more that owners are not completely changing everything by doing a full blown renovation, but often opt for a few changes to update the spaces and make sure it all stays fresh. It is obvious owners who do not want to do full renovations are regularly considering the look and feel of the offices and shops as they feel that a small change often is a more economical way to go than letting it all run untouched for a long time and than having to completely renovate. If we look at retail specifically, we see that successful retailers see their shop concept as a valuable asset. They often want to make small changes so they can surprise their regular customers and keep the experience of visiting their shop exciting. This is very important in this day and age where internet shopping gets more and more important. Keeping your loyal customers happy is paramount. As Commercial Electricians in Brisbane we often get asked the question what a small change to the fit out of the shop would cost. And often owners are surprised that the cost is really not as high as they thought it would be. The good thing about a well setup electrical and data cabling system in a commercial environment is, that changes actually usually are easier to implement than in many residential environments. A good Commercial Electrician keeps changes in mind when designing a new office or shop fit out. This is a very different approach from a residential design where we are usually far less flexible due to the way a house is built. It is very satisfying to see that especially retailers in fashion, jewelry and opticians have recently been making changes to their shop fronts and have had a lot of success with this without breaking the bank! As Commercial Electricians we love to be involved in these projects that are usually led by a designer. The designer will discuss the situation with the owner and will need to have a good look at what is not working in a specific shop. Have a look at what is old, dark, uninviting, dirty looking, boring or not logical. Just focusing on improving these areas often can bring fantastic results. As Commercial Electricians Brisbane we have our input in this often, as lighting of areas in a shop can make a huge difference. 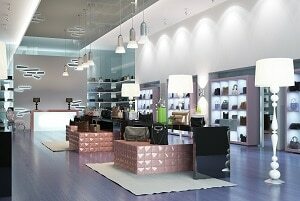 Customers are also sensitive to trends in lighting, although we notice this is often not something people realize! Modern lighting systems are appreciated, but not really noticed. Interesting! Another part of a partial renovation or uplifting of a retail or office space is off course that it gives us the opportunity to at the same time improve network cabling systems. Changes in our requirements regarding access to computer systems and internet are changing almost daily, and we notice this in the questions we get asked as Data Cabling Specialists. So to conclude we see that many successful retailers are shifting from full renovations of their shop fronts to more often creating minor changes to keep clients interested. This is a great strategy that is easier to finance and causes far less disruption of business. As a Commercial Electrician in Brisbane we are often part of full renovations and smaller changes. A good design at the start is important to keep the cost of desired changes later down.